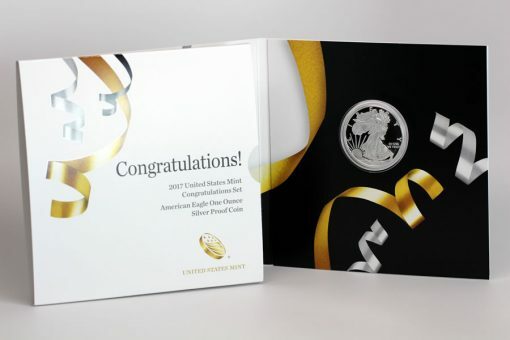 Those in need of a gift idea have a new option from the United States Mint with launch of the 2019 Congratulations Set on Jan. 10. Found within the set is one 2019-W Proof American Silver Eagle, which also makes its debut on the 10th as a stand-alone option. Pricing of the Congratulations Set is $56.95, a one dollar increase over the individual proof Silver Eagle. It joins two other special occasion products released last week, the 2019 Birth Set and the 2019 Happy Birthday Coin Set. However, whereas those are designed for specific celebrations, the Congratulations Set can be given for a variety of special occasions. Congratulations Sets date back to 2013 and have been an annually released ever since. Their popularity has varied but thousands are sold each year. Last year’s set realized sales of more than 19,260 units. The set’s proof American Silver Eagle is encapsulated in a special presentation folder so that both its obverse (heads) and reverse (tails) can be seen. On the outside of the folder, the word "CONGRATULATIONS!" is printed along with "2019 United States Mint Congratulations Set" and "American Eagle One Ounce Silver Proof Coin." A CoinNews photo of a 2017 Congratulations Set. The set for 2019 uses the same style and celebratory- themed folder. Inside, plenty of room has been allotted for a personalized message. On the back of the folder, the U.S. Mint’s Certificate of Authenticity appears. American Silver Eagles are composed in 1.000 troy oz. (31.103 grams) of 99.9% silver and have a diameter of 1.898 inches (40.60 mm). Proof coins feature frosted designs against a mirror-like background. The set’s American Silver Eagle is produced at the West Point Mint and bears its ‘W’ mint mark. 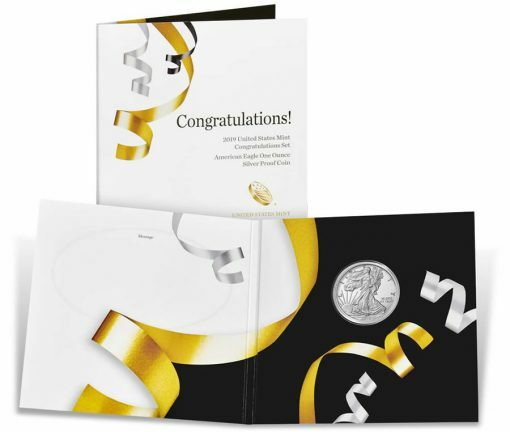 Those interested in ordering a 2019 Congratulations Set may do so directly from the United States Mint when it becomes available on Jan. 10 at Noon ET. Place orders from the U.S. Mint’s Gift Ideas section or by call 1-800-USA-MINT (1-800-872-6468). There is no product or household order limits. Wow, 9:05 west coast and no longer available. I bought 2 at 9 sharp…clicked back to buy 2 more and they were all gone! How can it be sold out when there is no mintage limit or limit on how many you can order??? ?I bet the guys on TV ordered them all to resale! Mr. Mike “Sold Out, Limited Edition” Mezack is already selling them for $199.99 in PF70 (Anacs). I think the real winner here is the 2018 congratulations set. I look for them to start increasing in value. Seller has 10 or more for sale!!!!!! Why would anyone pay $200 for the packaging The coin is the same as the proof ASE, still available for approx. $90 PCGS. The only Congrat. coin worth anything is the 2017 s mint which was only available in congrat and limited edition proof set for that year. If the mint put out an ASE wrapped in bacon, frantic collectors would buy it!